Our Cinnamon Apple Protein Pancake Mix is made using real apples, whole oats and quinoa. 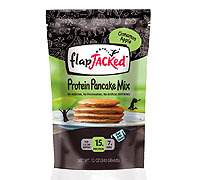 These delicate and delicious protein pancakes are light and fluffy yet loaded with vitamins, minerals, complete protein and fiber. With only 180 calories per serving, Our Cinnamon Apple Protein Pancake Mix is slightly nutty, will fill your kitchen with the aroma of cinnamon, yet will be slightly sweet to taste with a hearty 15 grams of protein and 7 grams of fiber in each serving! Ingredients List: Whole Oat Flour, Buttermilk, Whey Protein Isolate, Apples, Quinoa Flour, Cinnamon, Baking Soda, Baking Powder, Salt, Xanthan Gum.